Although much more delicate, Arial took on Heta’s features and appearance during her physical transformation. Therefore, the child of Arial and the King of UR also resembled Heta. During Arial’s pregnancy, when Arial needed strength to sustain her physical form, Heta asked the members of her Order for their life force energy. Understanding well the future of the Mid-Realm was at stake, they agreed to the sacrifice. When the child is born, she holds the collective life force of the whole Order of the White Flower. Upon the birth of the child, Arial’s form dissipates. Heta, now as Ermengarde, becomes the child’s devoted nursemaid and guardian. Through songs, music and poetry, Ermengarde always encourages the development of the young princess’ wild, rebellious wind spirit. At the point in the story when Ermengarde and Princess Arlet** flee together on horseback to escape from Bardulf’s ambush, they race towards the grove where the magic was initially performed sixteen years previous. A stray arrow pierces Ermengarde who pushes the princess into a mass of braided vines covering the mouth of the Crystal Caverns. The wall of jasmine vines give way and protect the young princess from the fall, as seemingly she’s swallowed by the earth. The jasmine flower*** wall springs back and blooms to congeal the entrance to the crystal cave. When the pursuers find Heta’s stone form, they mistake her for the princess and become fearful of the magic of that place, lest they be turned to stone as well. But Bardulf is no stranger to magic and is not afraid. When Bardulf locates the place and inspects the statue, he notes there is no ring upon its finger. With his sword, he cuts away the wall of vines and discovers the entrance to the crystal caverns. *Ermengarde or Ermengard or Irmingard or Irmgard is a feminine given name of German origin derived from the German words “ermen/irmin,” meaning “whole, universal” and “gard” meaning “enclosure, protection.” Thus her name means to protect the whole. **Princess Arlet is, apparently, one of the names I assigned to the Princess of UR before she becomes Jasmine. The Princess Flavia de UR seems to be another name I used for her. *** The jasmine flower is associated with love. 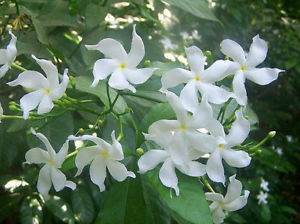 Jasmine also symbolizes beauty and sensuality. In some cultures, Jasmine represents appreciation and good luck. When used in religious ceremonies jasmine represents purity. The meaning of Jasmine varies depending on the culture and setting. This entry was posted in Jasmine & Role Playing Games and tagged Bardulf, Crystal Caverns, Heta, Jasmine, King of UR, The Story of Jasmine on February 4, 2018 by Darlene.